Charles was born in Scotland and educated at Bembridge on the Isle of Wight, a school with strong links to John Ruskin and the Arts and Crafts tradition. Following art school he completed his architectural training and, qualifying in 1982, took his first job with the antecedents of Sheppard Architects, Green Lloyd Architects. After this he took a series of positions with major London firms during the 1980s and was responsible for a wide range of projects across all sectors of the industry. 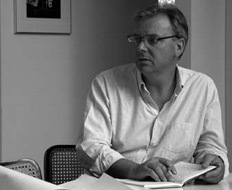 In 1993 he rejoined Sam Lloyd and became a partner (Lloyd Sheppard Architects) in 1996. Charles’s work has been published in major architectural journals and he has won ‘Office of the Year’ and 'The City Heritage' awards. He has extensive experience working with historic buildings and also carrying out contemporary interventions and alteration works within historic settings and Conservation Areas. For many years Charles was an architect member of the London Diocesan Advisory Committee for the Care of Churches and also a member of the Victorian Society’s Southern Building Committee. He has extensive ecclesiastical experience and has carried out major alterations to Grade I listed churches. Charles formed Sheppard Architects in the spring of 2007. Christopher is an architect with over 30 years of experience in the profession. Prior to joining Sheppard Architects he was a director with an architectural practice specialising in commissions for sympathetic restorations and additions to landmark historic buildings, notably at the British Museum and the Palace of Westminster. His career has also included several years experience with large interior design companies where he has undertaken museum, exhibition and retail projects. With substantial site and office experience he is at his best with a mix of creative and technical design development work and all aspects of project administration. He has recently been responsible for our successful project for the Bishopsgate Institute. His experience of client liaison and team management, including co-ordination of consultants, together with a practical approach to site work, makes him a key asset to Sheppard Architects. Christopher’s continuing professional development has included a recent MA and currently a university course in philosophy. Oliver trained at The Bartlett and London Metropolitan University, qualifying in 2011. He joined Sheppard architects in July 2011. He has previously worked for Matthew Springett Associates and Surface to Air Limited.